The gadfly petrels are seabirds in the bird order Procellariiformes. These medium to large petrels feed on food items picked from the ocean surface. The short, sturdy bills of the Pterodroma species in this group, about 35 altogether, are adapted for soft prey taken at the surface; they have twisted intestines for digesting marine animals which have unusual biochemistries. Their complex wing and face marking are probably for interspecific recognition. burrow or on open ground. They are nocturnal at the breeding colonies. 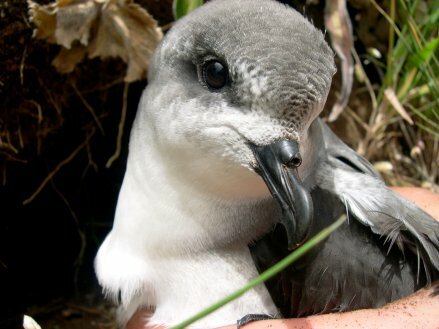 Emergency conservation work pays off: Zinos Petrel bounces back! heart of Madeiras central massif, where this globally endangered bird breeds. obvious nests on the barren mountain ledges. the Natural Park of Madeira (PNM)  was jeopardized. The situation was grave indeed  the fire not only led to a near-complete breeding failure in 2010, but also exacerbated soil erosion, causing several nesting burrows to collapse. the breeding ledges to protect the soil in some of the most critical places. Then, with financial and logistical support from SPEA/BirdLife in Portugal, the RSPB/BirdLife in the UK and BirdLife International, about 100 natural nests were restored, while 60 new artificial nests were built. A protective cordon was also built around the known breeding areas, with cat traps and bait boxes. 45 nests were occupied  with eggs laid in 43 of them. Although breeding success was lower than before the fire, with only 19 nestlings hatching, the species prospects looked more positive again. Moreover, fledgling success was good, with 16 out of the 19 young birds eventually flying out to sea in October. PNM and SPEA are now more hopeful for the future  and will keep fighting the battle to save Europes rarest seabird species. This work was funded by the BirdLife Preventing Extinctions Programme, Mark Constantine and many generous donations to BirdLifes online and World Bird Club appeal. Zinos Petrel has also benefitted from Save Our Species (SOS), a joint initiative of the Global Environment Facility, IUCN and the World Bank, which aims to ensure the long-term survival and well-being of threatened species and critical habitats for biodiversity conservation. These achievements would not have been possible without the funds provided by members and supporters of SPEA, the RSPB and BirdLife International.